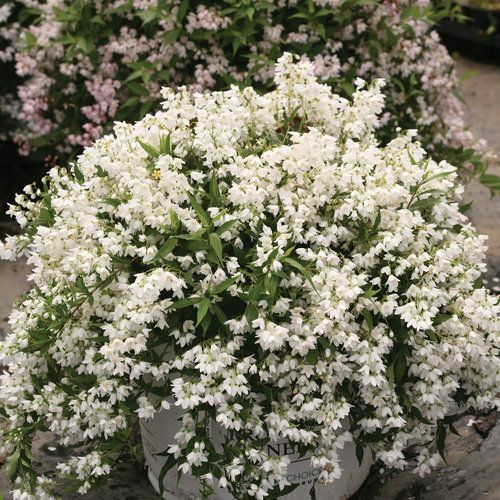 Deutzia is named after the 18th century Dutch patron of botany, Johann van der Deutz. With more than 60 species, these lovely shrubs range from 1-13’, however the ones typically used in landscaping are the smaller ones. Varieties hardy to our area are all deciduous and can have gorgeous burgundy color in the fall. Deutzia are relatively new to landscaping here in the United States. People are just beginning to “discover” the beauty and versatility of these shrubs. Proven Winners has developed some varieties that we highly recommend. At 12’24” the Yuki Snowflake® and Yuki Cherry Blossom® are the perfect shrubs for your landscaping. They are deer-resistant and the hummingbirds love them. They start blooming in early spring and continue through the entire spring season. Keep these beauties in mind for your next landscaping project.